Not all dates are created equal. 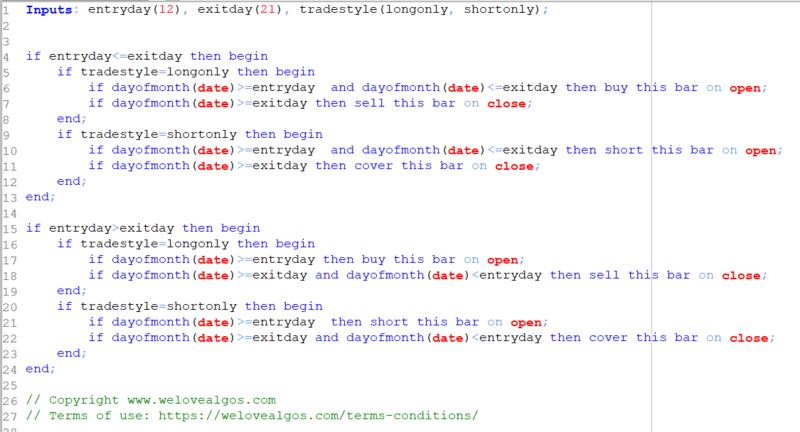 This article is all about date based patterns, date based and weekday based. It shows statistical evidence that not all days are equal and presents a simple algorithmic strategy to profit from these date and day based patterns. But see for yourself. Did you ever ask yourself if there is a difference in holding a position from the first to the fifteenth or to hold it from the fifteenth to the first? Would there be a statistical edge if you buy on the 25th and sell on the first Friday of the next month? Or are there no specific dates and date ranges, no statistically extraordinary weekdays to exploit and you don’t have to look at the calendar when trading? To see if there are such kind of pattern present in the market, one would backtest a test strategy which looks at all possible entry-exit day combinations for their profit over previous years. The test results shown were created by using daily Dow Jones Industrial Average data from 2000 up to now. The chart below uses a heat map to visualise the profit factor of all entry-exit day combinations. On the horizontal axis the entry day is shown, on the vertical axis you see the exit day. The colours represent the profit factor of a simple entry-day / exit-day strategy. The darker the green, the higher the profit factor. These are the days you would want to be invested in. Red areas are dates with low profit factors, days you want to avoid when investing in the Dow Jones. 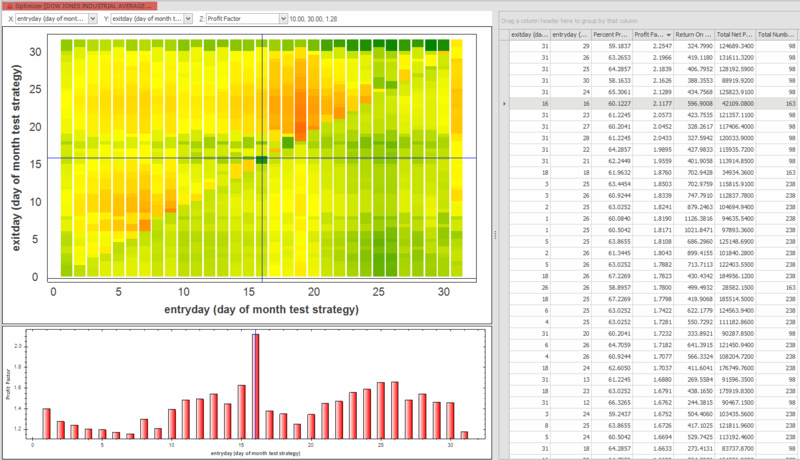 Analysing the heat map above, some very interesting date based profit areas can be observed. Let’s start with an extreme example, and take the 16th (cross hair on the heat map). With the 16/16 parameter setting, the strategy invests 100.000$ every 16th at market opening, and closes the trade in the evening at market close. This would have given you a profit factor of more than 2 and more than 60% of all trades since 2000 would have been winners. A more general observation would be, that holding over the end of the month seems to be extra profitable. The area with an entry around the 25th and an exit before the 7th shows stable results. You hardly got hit by the tumbling of the card house in 2007-2009. Also other major market corrections can not be seen on the accumulated returns chart of an 25th-7th investment strategy below. Not all dates are equal, that’s for sure. Beside the good days shown above, there are also some days when you should not be invested in a date based portfolio. For the Dow Jones Industrial Average this clearly is the period around the 20th. The chart below shows the returns for a strategy investing 100.000$ on the 19th and closing the position on the 23rd. Even with this incredible bullish market, an investment from every 19th to every 23rd of the month would have been a losing position. Compare the 19th-23rd returns below to the 25th-7th returns on the chart above. Beside the purely date based patterns one can also search for specific days of a week. See the test strategy and the results on the chart below. Buy on third Friday of the month or better on second Wednesday? The heat map shows the winner: For Dow Jones it clearly is the 3rd Tuesday of the month. See the backtest result for an investment only on this day on the chart above. The long-only strategy returns have not been affected by any mayor bubble burst since 2000. To test date based patterns on your data you will need the script shown below. Please save it as trading strategy and apply it (together with a position sizing algorithm, contact us if you would like some information on these) to any chart or portfolio. Select if you want to search for long or short patterns, and use the optimiser to test all possible entry-exit day combinations. Please contact us if you would like to know more, and apply the same kind of excercise to your markets. Let`s find the profits. Tradesignal® is a registered trademark of Tradesignal GmbH. Unauthorized use or misuse is strictly prohibited. 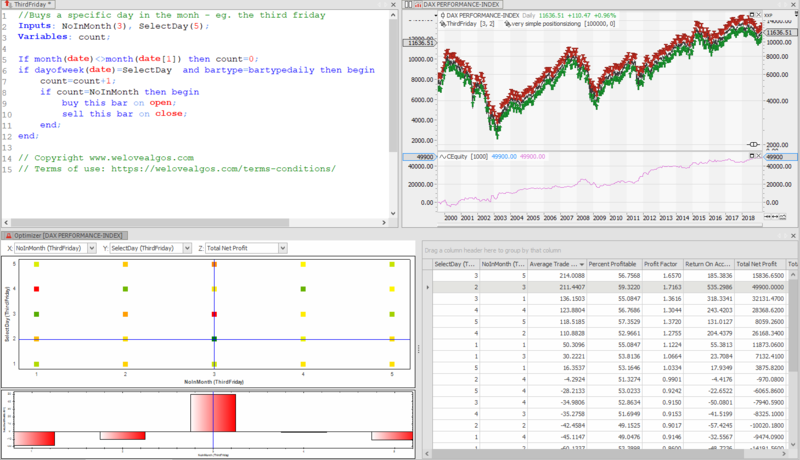 Data by Refinitiv EIKON.